Collaborative and Service Projects (CSPs) benefit from the advanced technologies, facilities, and infrastructure provided at NRAMM. These efforts range from providing technical assistance to other laboratories to providing on-site access to instrumentation, staff and other resources. Support for an on-site project often takes the form of a few days of technical support and microscope time. NRAMM personnel provide assistance with sample and grid preparation, and setup the microscope and Leginon to acquire data according to the user’s specifications. CSP users are expected to monitor the data acquisition sessions once they have been setup and we generally try to operate the microscopes around the clock during these visits (“synchrotron style”). The users are then provided with access to all of the images and metadata associated with their project by means of the database and the web-based viewing and data transfer tools that are standard aspects of Leginon/Appion. We usually also get users started on preliminary data processing steps, (e.g. CTF estimation, particle selection, 2D classification), and when possible help them to reconstruct a preliminary 3D map. They then either continue with additional image processing and analysis in their own laboratories or use a moderate sized cluster that NRAMM has set up to allow remote users who lack adequate computing resources to continue processing their data. 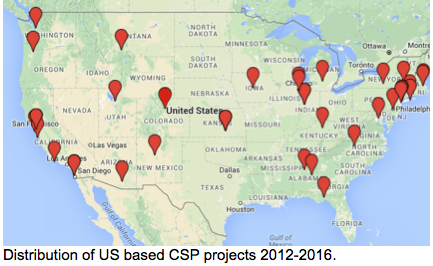 During the past four years, NRAMM has provided support for ~50 CSP projects from institutes spread across a wide geographical area. NRAMM support was acknowledged in ~50 published papers associated with these CSP projects. NRAMM welcomes applications of both collaborative and service projects and the application process is described here. In addition, we have provided extensive support to other laboratories and institutions, including ~30 during 2015-2016. Typically, this involves providing assistance with the installation and setup of the Appion and Leginon software. The software setup is relatively complex and for many external sites it is more efficient for NRAMM staff to provide direct assistance. NRAMM staff also provides support for new applications of the software at external laboratories; in many cases, the software may need to be customized for microscopes and cameras and other instrumentation that is not currently supported in Leginon. NRAMM personnel also support the technological infrastructure that underlies the data collection and processing pipeline at SEMC which serves well over 100 projects.